I'm going to get the entire car soda blasted soon, but what would be best to do in the side boxes before doing the welding? What have you used to clean them up and get rid of the old gunk/paint etc? Is it ok for me to clean up the surfaces that are going to be welded only and then blast the rest of the box later when the whole car is being done? Or should I clean up now while the sidebox floors are removed? it is a shame the outside of the car looks pretty decent. The soda will probably struggle to remove a lot or any of the heavy rust in the floors and side boxes. I would suggest you get the whole car blasted, preferably grit media, and find all the hidden nasties and give yourself nice clean metal to weld too. I'll look into getting that done. The car had some attempted "rust repair" done by the previous owner, which included welding plates ontop of the rust in the floors and giving the outside a respray some years back. They basically welded up the floor across the Bermuda triangle where it had all disintegrated underneath. The side box internals look solid except for the bottoms of the dividers as I mentioned earlier. Some more work done, ive removed the entire floorpan now and also the toeboard and all the sidebox floor pans. New ones are on the way. Now to fix up the bottoms of the pannier dividers and clean up the insides of the sideboxes and get them sandblasted. What have you guys used inside your sideboxes...POR15? - Finally welding some new metal in, fixed up one of the pannier divider bottoms...feels good to get some new metal into the thing, instead of cutting more out!! - I plan to POR15 inside those boxes...have you guys used any seam sealers etc.. over the welds, or just POR15 straight over them after being primed? I'm no expert Gizmo, but for what it's worth I put KBS (seemingly a POR15 equivalent in another brand I believe) straight onto the bare metal, i.e. no primer or sealant first. This stuff seems to cling to metal better than etch primer. I don't know if there is any difference between the brands though. The primer that was applied by the blasters is pretty thick and has stuck on pretty good..
perhaps I should rough up the inner box areas and apply some black stonechip stuff instead in there? I used por15 on the subframes and while it is good stuff its expensive and it must be painted directly on the metal folloing the proper procedure. A product necessary for proper adhesion is por15 metal prep, its sprayed directly on the metal and left to etch the steel. With metal prep you can feel it make the surface rough while increasing the rust prevention as it leaves a zinc phosphate coating. Im no expert but in your case since you paid to have it blasted and primed maybe just go for a standard paint system? Im going to be using the Wurths aqua stone chip stuff soon but i will be spraying direct to metal. I'll seam seal all the welds/gaps etc in those boxes and then coat with something that can go over the existing primer. When I do the subframes I will do them in POR15...so I will ask the blaster not to pre-prime. Well...I have finished repairing all my pannier dividers now. I see some of them had drain holes drilled into them from factory, have you guys re-drilled these drain holes or not bothered again after repairing? I am now ready to start putting the floor sections in, the way I see it I will need to do the outer pans first as they have angle sections on their inner facing sides, and these angled bits will need to be welded in before the inner floorpan can be installed?. Once they are fixed, then do the main inner floor pan? Ready to weld the first piece of floor in...exciting!!! you are not going to weld those two panels you have clamped together are you? The big panel on the left needs to be removable. No Im not going to, thanks for that reply though. I am using that panel to drill the holes in the fixed panel for the bolts that mount that removable panel. Wanted to get everything aligned up first before welding....the old adage....measure twice, cut (or weld!) once. 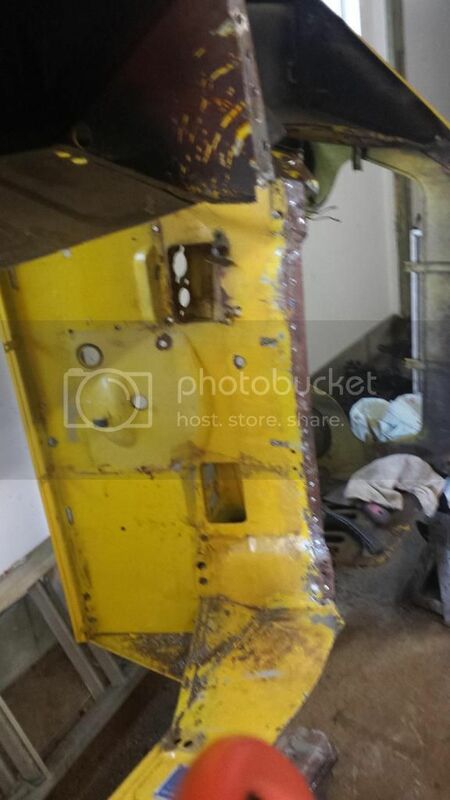 with so much of your floor missing and the body resting on its side as in the photo I think your big concern would be to keep the body square as you weld the pieces back in place. 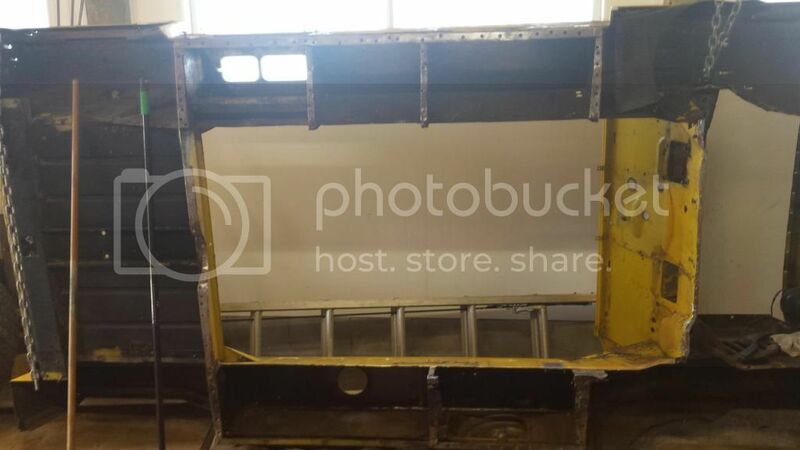 There is a series of good pictures in a thread a few years back from a US Moke owner who turn his pile of rust back into a Moke where he had welded up a stiff looking jig to keep important bits locked in place. Someone may remember his name or the posts and offer it up here for you to look at.